Bill, 96, died at home in Santa Ana on Sunday, February 10, 2019. Bill was born October 6, 1922 @ home to Raymond and Charlotte in Indianapolis, Indiana, the first of two children. 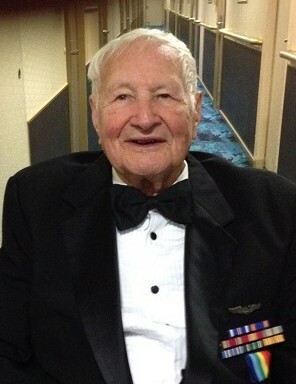 Bill enlisted 1942 in the Glider Pilot Training Program and Civilian Pilot Training at Indiana University then transferred to Aviation Cadets. He attended Aerial Gunnery Training in Texas, commissioned 2nd Lt. in the Army Air Force, graduated Navigational School 1944, completed B24 training with 8th Air Force 446th. Bill completed 35 missions over Germany in “Naughty Nan”, was awarded numerous medals including the Distinguished Flying Cross, married Jean (almost made it to their 71st wedding anniversary) and was released from active duty in 1945. 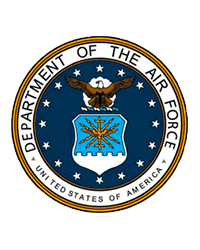 He then graduated with a BS, Metallurgical Engineering, 1948, from Purdue University and returned to active duty as a high temperature materials project engineer at Wright-Patterson Air Base. Bill left active duty in 1952 but continued in Reserves achieving the rank of Lt. Colonel in 1982. He lived in seven states from New York to California, working in the steel, automobile, and aerospace fields (retired Aerospace Corp 1984). He ran for the U.S. House of Representatives in the 40th District, 1976, owned a foundry and later a printing company, served as an elected member of the Municipal Water District of Orange County (MWDOC) 1977-2000, as well as serving on the MWD board in L.A. Bill was a soccer coach for several years for Bill, Jr. He founded the 446th Bomb Group Association to honor and to memorialize the servicemen killed in action and those who served in WWII. On overseas trips undertaken on his own, he represented the 446th at dedications to honor servicemen lost in or near villages in England, France, and the Netherlands. These villagers have paid for and installed memorials to the downed men to honor the Americans for their sacrifices. Bill never let his macular degeneration leave him in the dark. He embraced visual aids, learning to hunt and peck with a magnifying glass to use his computer for correspondence. He continued to enjoy novels and news by subscribing to Books for the Blind. Always a dog lover, Bill was seen twice a day walking the neighborhood with his beloved guide dog, Aunyx. He even traveled with Aunyx to the National Disabled Veterans’ Winter Sports Clinic. Bill is survived by his son Bill, Jr., and children Lily, Mia, Laila, and Ava Eleanor, his daughters Jeanne Davenport, Leslie and John Wieland, Darcy and Steve Gregg, along with their son Travis and Christine and children Hailey, Travis II, and Jenna and their daughter Jennifer and Sean Regan, and children Ella and Lucas. Viewing will be from 4-8 pm on Thursday, February 28 at Shannon Family Mortuary, 137 East Maple, Orange, (714) 771-1000. A Celebration of Life will take place at the Church of the Foothills on Saturday, March 2, at 3 pm., 19211 Dodge Ave., Santa Ana, (714) 544-1319. Both services will be presided over by Pastor Mike Holland. In lieu of flowers, donations to Guide Dogs of America are requested in honor of Bill’s guide dog, Aunyx, class of 2008, or donate to the Church of the Foothills.